I said I’d get stronger. I went through my notes, did some research, and BOY did I get stronger. 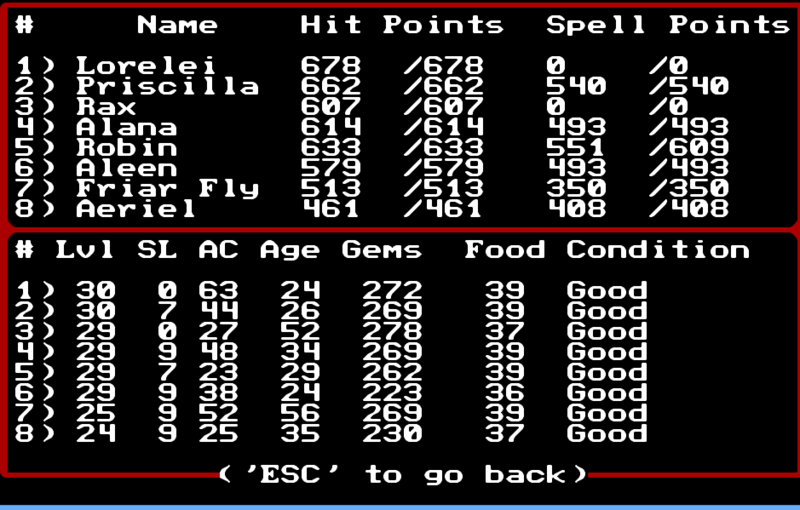 As it turns out, your average high-level Might and Magic II party is miles ahead of your average high-level Might and Magic Book One party. First of all, I got rid of the whole avoid leveling idea. It doesn’t work. Levels mean health, more damage and access to better equipment and honestly, the level-scaling really doesn’t feel as bad as I read online. Then I went through my all notes and revisited some of the stat-boosting places I had notes off. I did some experimenting and used some Google-Fu to figure it out. 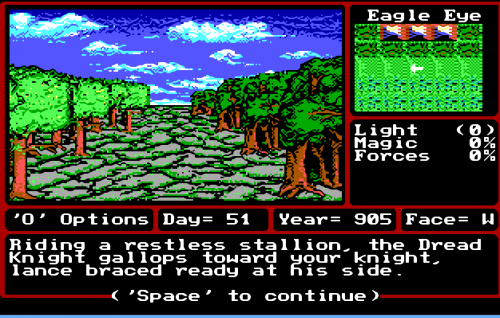 Stat boosts in Might and Magic II work after resting. You use the stat boost and then rest to see the effects. This actually means I got all the boosts I found, I only failed to notice because I didn’t rest immediately after. Well, I returned to all of them and tried to use them a few more times. It worked! Stat boosts work all the way up to 59 in each stat. It’s a bit special, though. If the boost would increase that stat past 59, then it doesn’t work. This means that if you’re at 49, you can get it to 59, because it adds 10 points per use. If you’re at 50, though, it won’t work anymore. In any case, I found all stat boost locations except for personality and then used them to increase all of my character’s statistics to the 50-59 range. Then I did some more research and realized there’s one other aspect to all of this. You can get way beyond 59. Other than places where you can outright boost your statistics, there are places in the Cron where you can push them way beyond 59 points. It works on a single character and it trades 3 points in one stat for 5 points in another, so it’s costly. However, if you use the free boosts to 59, you can do stat trades over and over again until you get all but one of the statistics to an extremely high level. Due to programming limitations, this value seems to be 255, but since items add bonuses as well, even at an extreme, I wouldn’t go past the 200-220 range. The ogre actually trades intellect for might. That ogre or orc, offering me to trade all of my stufffor all of his stuff was an example of this trade. I thought he would be like the hermit from Secret of the Inner Sanctum, but he was actually very different and the conversation he provides actually hints at this. People call him dumb, so that’s what he doesn’t have – Intelligence. He’s strong, though, so he has plenty of Might. He wants to trade my intelligence for his might. It’s actually a clever line, in hindsight. So what did I do? I went and found a source of Intellect below Atlantium. I cast Lloyd’s Beacon on top of it and then paid a visit to the orc. I traded the Intelligence on all of my characters for Might. Then I recast Lloyd’s Beacon and used it and the clerical spell Surface to get Intellect back up to the 50-59 range. I did this several times in turn, until everyone’s Might was in the near-200 range. I did the same with Intellect and Endurance. For Accuracy and Personality, I didn’t go as high, but I still boosted them up to the low 100s. As for Speed and Luck, Luck, I started on the wrong end of the deal, so the only way to boost them was to reduce one of my boosted attributes to their low value again, so I was content with getting them up to their fifties. With all these free stats, I fully expected to boost the last two via items anyway. In Dragon’s Dominion, there’s was a place that I could now reach, where you can boost everyone’s health by 25. I did this about a dozen times, keeping any decent items I found along the way. This got my health to the 500 range and got me a couple of highly valuable items. Why? Because of what I did next. The Enchant Item spell raises an item’s enchantment level by 1, so a +1 short sword can become a +2 short sword. This can be repeated as many times as desired, as long as the sorcerer has enough gems and their spell point pool is big enough. At Aleen’s current state, with enough resting, she’s able to get any item to +11. So what did I do? 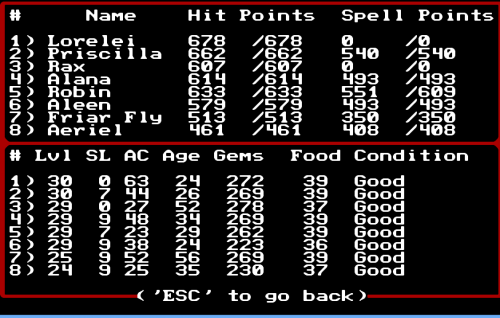 I went to E1, to the Gemmaker’s Volcano, where I was able to use Etherealize to find the gem maker and make him teach me the spell in exchange for 10 years of unnatural aging on each of my characters. While I was there, I also found a bunch of gems, as well as a set of fire enchanted gear, which I sold. I enchanted the class items as well as some other gear to +11. Somehow, I got my hands on a G(old) Plate Mail, which is the best plate mail in the game. 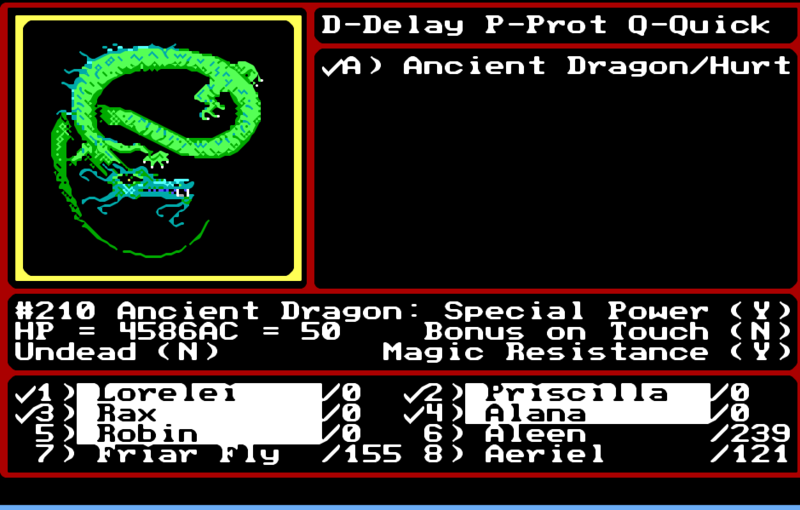 I enchanted that one to +11 as well, and then I did something even better – I used Duplication (S7-2) to create another one and give it to Priscilla. Now both Lancelot and Priscilla had some awesome items. I also enchanted some other awesome things and basically made the party several dozen times more powerful than it was before. 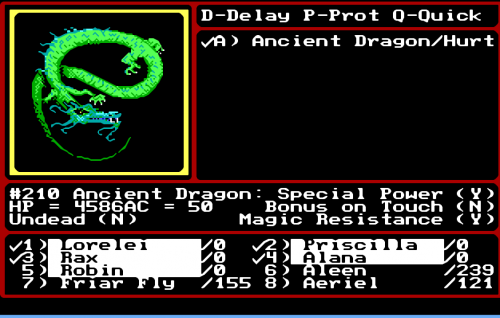 I went back inside this dungeon and tried my luck with the Ancient Dragon. Nope! I managed to cast Identify Monster on it and realized it has about 5-6000 health (it was at 4000 when I cast the spell). It also hits several characters for a couple of thousand damage. I’m lucky I was able to escape. So Dragon’s Dominion was still out of the question. I did have options, though. Let’s keep this simple. I’ll just try to list some of the things I did. Mount Fairview was in D2. I actually had it in my notes. I’ve done them all, other than the ones for ninjas and barbarians, since I don’t have those classes in my party. Some of them were simple, some of them a bit less so, but all of them were very manageable. 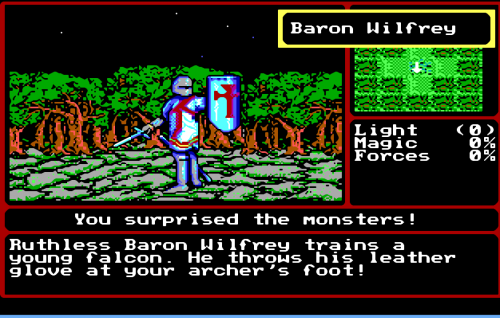 I took the character of that class, Rax and Rat Fink along for each quest. 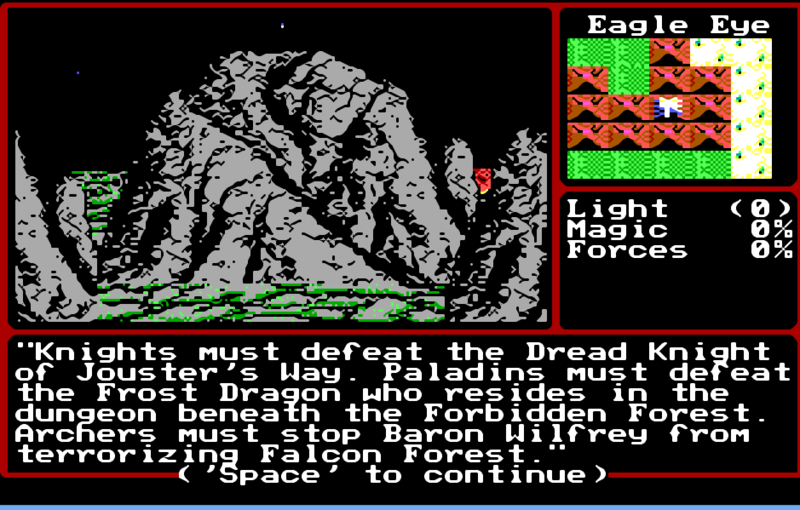 I thought Rat Fink Pathfinding and Mountaneering, so I could more easily navigate and that was mostly it. The Archer quest was simple. I had more health and did more damage. I enjoyed the Sorcerer Quests the most, because it involved using a bunch of notes I took while exploring the various dungeons. 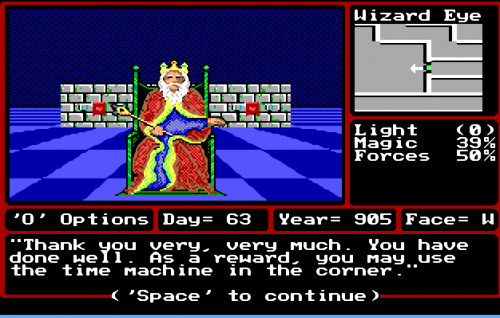 Two of the notes told me what path I need to take in the two castles, and two of the notes contained codes to free the two wizards. It felt great to figure this out. 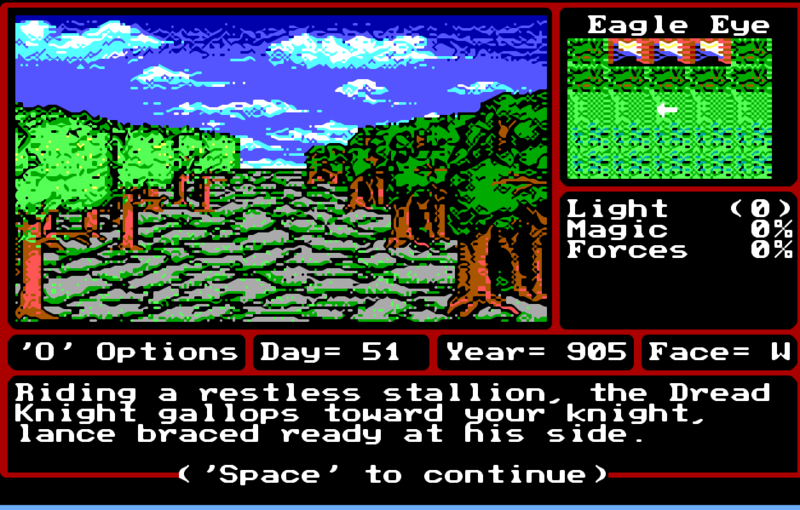 The knight quest was slightly more difficult than the archer’s, but not by much. Doing the class quest added a plus sign next to that class on the character sheet and gave me 5 million experience points, boosting each character by about three levels. I loved doing the sorcerer quest. I bought three black tickets and fought in the arenas again. That and the class quests was enough to get an audience with the queen. She sent me to Lord Peabody, but he wouldn’t talk to me until I found Sherman. 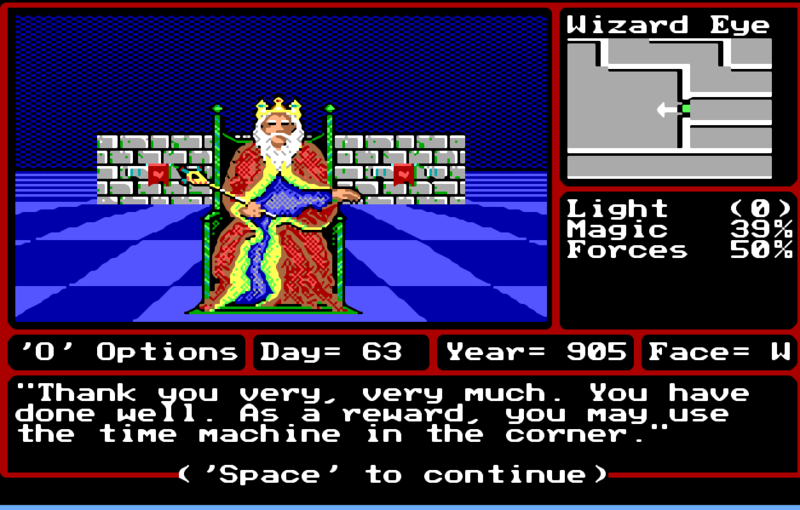 As with Book One, there’s a lot of things to do, before you can talk to the main quest giver. Mighty Nakazawa and Lord Peabody’s servant Sherman were last seen having some problems with Amazons near Native’s Cove at 10,1. I have no idea how I missed this, but apparently, Sherman was just a hireling and I freed him ages ago. Talking to Peabody with Sherman in my party was enough to complete this quest and enabled the use of Peabody’s time machine. With Sherman freed, the time machine became available. I really wanted to kill the Orb Guardians in Dawn’s Cave so I went there and did just that. It was actually very easy. They were guarding an item called the Elemental Orb, but I have no idea what it’s used for. Well, I do have an idea, but I’m not sure what I need to do to be able to take it. What I do know is that I was unable to leave with the orb in my inventory, so I had to drop it. I guess I’ll come back for it later when I do some other thing I have to do. There’s no point in listing each of the many upgrades I had. Instead, I’ll just say that the protagonists are at levels 29 or 30, and the mercenaries are on 24/25. I have some of their attributes maxed, in part with stat boosts and in part with items. I also made a list of the items I’ll be trying to find for enchanting and duplicating. When it comes to armor, I already have an Invisocloak, which is probably the best choice for an accessory. For the shield, I’m aiming for Gold or Magic Shields. The rest of the armor set will be all gold, meaning I already have the plate mail. For weapons, I decided to go back to one-handed weapons as soon as I get the chance. With high-level enchanting, the weapon’s base damage isn’t that important so instead, I’ll aim to use a shield for a nice defense and resistance boost. I also need speed, so I’ll probably have a pair of boots on each of my characters. My plan is to find an item and keep enchanting/duplicating it until everyone has it. My current plan is to go back in time and find the elemental discs which should all be in castle Xabran, according to my notes. I also plan to go and do the optional quests as well. Just as an example of how far I got, this is where Lorelei is at. After that, I’ll see what’s to be done, but I’ll probably be visiting the elemental planes next. 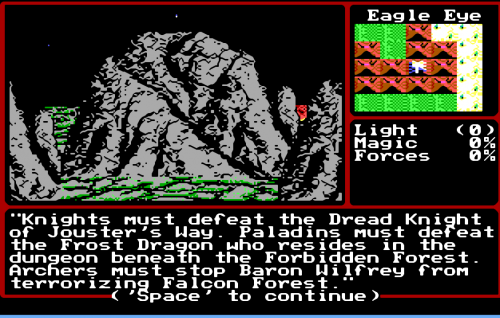 Previous Previous post: Might and Magic Book Two  – Dragon’s Dominion is hard!